Bernard Britland – missing solider, wounded, prisoner of war – reveals his home thoughts from abroad with a series of distressing, heartfelt and sometimes humorous open-postcards to his beloved family from August 1915 to January 1918. Image 1: Soldiers posted on the Western Front were able to buy postcards and other souvenirs to send home to loved ones. This postcard is from the family collection of Esther Edwards. On Monday 2nd August 1915, Britland’s mother received a devastating report from a Hospital Municipale in Belgium: he was wounded in both legs and taken prisoner by the Germans. Britland’s first letter, from a hospital in Belgium, pleads with his mother: ‘now whatever you do, don’t worry’. It is clear to appreciate his sincere and loving nature from the very beginning of this story. He is torn from his home, from his family and from those he loved the most. From beginning to end, these letters reveal how Bernard Britland, of the 8th Battalion, kept strong for the family that remained in Stamford Road, Mossley, a small Mill town on the edge of the Peak District. Yet, his distress and agony of being torn from those he loved becomes crushingly difficult. Britland was part of The Rifle Brigade (41st Brigade, 14th division) and trained in England until he went to war in May 1915. Unfortunately, he was one of many who were shot and captured in battle and taken from hospital at Courtai, Belgium and then to German camps in Limburg and Giessen. He was allowed contact with his family through a mere two letters a month, where his hardship with each passing birthday, Christmas and family occasion grew. It is reported that Britland left the hospital on the 17th January 1916 with the wounded and travelled to Limburg by train. Here, he was met by English soldiers from the camp who wheeled them into ambulances and into Giessen camp. Although apparently on the mend, the extent of Britland’s injuries is revealed through a letter to his father: ‘I have 1 wound on the top of my foot and another just under my ankle’. We hear the extent of the destruction through a letter to Pollie (his cousin) where he talks about a friend who had gone to Switzerland. ‘He has a bullet through the bone of his leg just above the ankle and it has left the leg shorter than the other’. The soldier he was describing had in fact been between the trenches 5 days before he was found – a fate which could have easily been Britland’s. Like many soldiers in these camps, Britland needed a hobby as a way to keep his mind from the long days, the destruction and the sadness that surrounded him. Britland found his salvation through knitting. Through his time in the prisoner of war camps, he was able to knit and sell a collection of navy blue sweaters for his family and the people around him. Image 2: This is another WW1 postcard from the family collection of Esther Edwards. Although this is not one of Bernard Britland’s postcards, it is a beautiful example of the type of postcards available to soldiers on the Western Front. Through these letters, Britland makes heartfelt remarks about the strangers and his family who sent POW comforts. It is clear he is full of pride for the duty he has been given, and clings to the hope of freedom and the faces of his family back in England. Written to Pollie, 20th November 1916 – a plea for hope. For those of you who are wondering what happened to Bernard Britland of the 8th battalion, he returned home to his family, and lived to the grand age of 83 in Ashton, until Sep 1968. This blog post was written by Laura Mostyn, a volunteer researcher at Tameside Local Studies and Archives Centre. Series of open postcards written by Bernard Britland (1914-1918) – Tameside Local Studies and Archives Centre. Letter from Bernard Britland to his cousin Pollie (1916-1917) – Tameside Local Studies and Archives Centre. 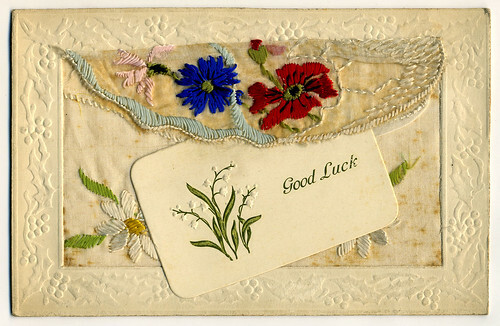 Image 1: Embroidered ‘Good Luck’ postcard from the Esther Edwards collection. 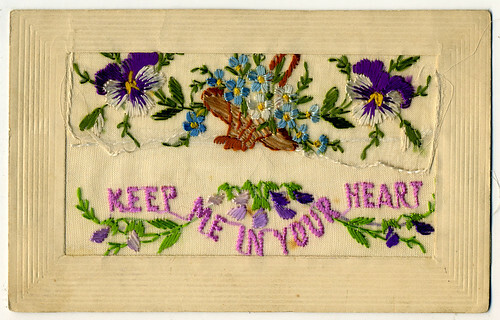 Image 2: Embroidered ‘Keep Me in Your Heart’ postcard from the Esther Edwards collection. I love these. We have some at Bolton, but haven’t been able to trace the author for certain. My granddad lived in Mossley not Ashton. I think the letter you say was to his cousin Pollie was actually to his future wife, my grandma Pollie Bradshaw.